Some buildings look like they haven't been changed or altered in any way for the last thirty or so years - the twenty-first century might be speeding along but they're still in the 1970s. Our shack in the bush is a case in point: it still has its original built-in cupboards, its original bathroom and kitchen, its original (now rotting) woodwork verandah and its original (now collapsed) gate posts. The Marjorie Propsting Library, but five minutes from our front door, is another time-warp destination but this time from the late 60s. It is also a shack, close to rather than in the bush, with hideous decorative concrete blocks built into its external walls and a flat tin roof. 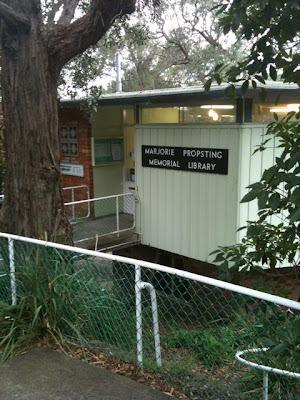 It's extremely small for a library and built on a slope so that you look down upon the building from the pavement. It reminds me of the mobile library that used to come once a week to a car-park near our house in St Albans when I was a child and so I keep expecting the Marjorie Propsting Library to rev its engine and move on.... However, it's a comparatively solid proposition that's simply ignoring the whirl of modern life going on around it. I joined Marjorie's library soon after moving into Glenview Street in January after Daniel pointed out to me that we would never be able to afford to freight all the books I am buying back home to London. He does have a point - my collection of Victorian novels has grown exponentially since living in Sydney because you can find things cheaply here that would cost the earth back home. (George Gissing's The Odd Women in its first one-volume edition of 1894 for twelve dollars anybody? - a novel I highly recommend you all read). So I am allowing myself to continue to buy the old stuff but when I want to read something written after 1900 I must turn to Marjorie Propsting. 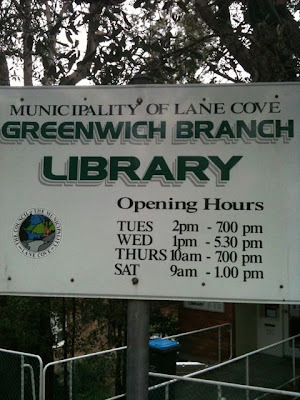 I phoned up in the afternoon after the morning I'd joined (for FREE) and asked whether they could get three books for me which I had found in the catalogue on-line of the larger neighbouring Lane Cove Library. Next morning they phoned me back, on my mobile, to tell me all three books were ready to collect from Marjorie's but five minutes from my door. What service! The best (and only good) service you get in Sydney! I thought I should push them further. Test their stamina. I phoned them up again a few weeks later (having read and returned the first pile of books) and asked whether they could buy some books for me that weren't yet in their or any of the other local libraries' catalogue. Of course, they said. Just tell us what they are and we will process an order...But they haven't been published here yet, I said, only in the UK. That's fine, I was told. We can still obtain them for you. 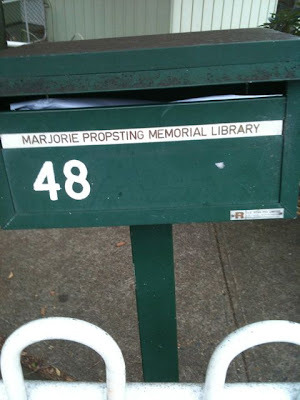 I love the Marjorie Propsting Library. I love librarians. Marjorie herself was a librarian. And a mayor (so being a librarian is obviously not a dead-end job but the first step on the political ladder). Marjorie set up this particular library shortly before dying of myocardial infarction in 1972. She had been elected mayor of Lane Cove in 1963 after years of work on various councils and committees but once in office always refused to be called Your Worship. She preferred the honorific 'Marj'. So 'Marj', thanks for setting up our local bookshop, I mean library. I will do my utmost to keep it running whilst I reside in Greenwich by putting in endless requests for obscure and not so obscure books. May your mailbox always be full to bursting.